This is a new 8 digit electronic calculator. Handy, pocket size. Display up to 8 digits. We'll be more than happy to satisfy you. 8 Digit Display. Pocket Calculator. If the goods are faulty then the standard statutory rights apply. Handy Size. 8 Digit Display. Black Pocket Size Calculator. Pocket Size. Quality Calculator fit for all purposes. We will reply you ASAP. Small and Compact and super lightweight so you can carry it around easily without the extra weight. 1 x Small Pocket Calculator. small calculator, easy to carry round. 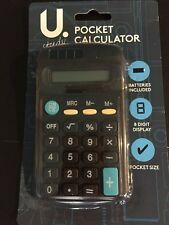 A 8 digit display pocket calculator with batteries included. 1 x Mini Calculator. We will always here to solve them for you. It won't help the problem to be solved. Product size: 4.8 4.3 1cm. Material: ABS. Color: Random color. 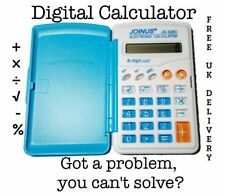 Scientific calculator with very good quality and competitive price. • scientific calculator. • Black key. • HOT SALE. • Button cell battery. • With cover. 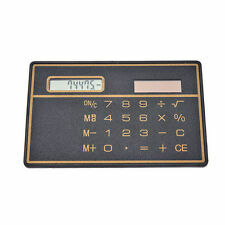 1x Mini Electronic Calculator. Color: Send It Random. We will reply you ASAP. Square root function. Auto power off. Auto Power off. It has a clear 8 digit LCD Display to enable easy viewing and is solar powered with a battery backup for reliability. Quality durable hard keys are standard, and the calculator is also very nicely coloured with colour corresponding function keys. All pictures are for illustration purpose only and Colours may vary slightly. Color: Random Color. Style: elegant, concise and practical. Functions: Office supplies, learning supplies. You can follow below process to chontact us. 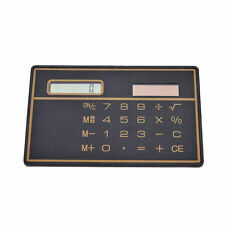 8 DIGIT DISPLAY MINI POCKET SIZE CALCULATOR for Home School Office. Condition is New. great solar powered slim calculator with free case great calculator , great design fits easy in any pocket or hand bag , 6.5cm x 9cm 0.5cm thin Dispatched with Royal Mail 2nd Class Large Letter. LC-160 - Casio Calculator With Protective Flap. Full detailed specifications are available from the manufacturer's brochures or their websites. The intention of London Car Audio is that all information on the website should be as accurate and up to date as possible. 10 DIGIT SCIENTIFIC CALCULATOR *UK seller *Fast post *Batteries included *10 digit elctronic calculator *Side colour may vary (green,Orange,red) If want a specific colour please message me .otherwise we will send a random colour. 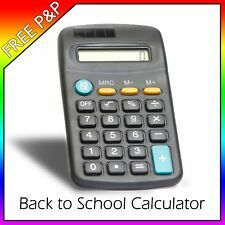 Small 8 Digit Pocket Mini Handheld Office School Calculator For General Office Use Office Stationary Supplies. Protective wallet. 8 Digit display. 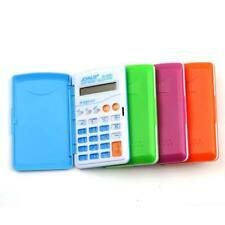 Small 8 Digit Pocket Mini Handheld Office School Calculator For General Office Use Office Stationary Supplies. Protective wallet. 8 Digit display. Clear Plastic Salad & Food Boxes & Containers, Microwave Plastic Containers, Plastic Salad Tubs, Disposable Plastic & Wooden Cutlery, Takeaway Paper Carrier Bags, Strung Kraft Brown & White Sulphite Bags. 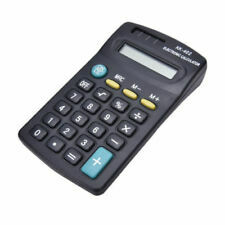 Calculator Busicom BS 7938eco. Solar / battery operated. 8 Digit Electronic Calculator. Pocket Size Make Easy To Carry With You Everywhere. Double Power. Q Connect Compact 8 digit Dual Powered Calculator with an extra large display. Ideal for childrens at school and office usage. Supplied complete with wallet. Rebell 12 Digit Calculator. Ideal for desktop and handheld usage. Dual battery/solar power. We aim to resolve any problem as quickly as possible. 1 x Mini Calculator. We will always here to solve them for you. It won't help the problem to be solved. Material: ABS. Color: Random color. Project calculator that does it all a must have on all projects small or big. A must have calculater for all projects big and small. New design blingustyle Crystal Diamante 12 Digit Dual Power. Size : 19 x 11 x 3cm. LIGHT WEIGHT. This is a new 8 digit electronic calculator. The color of the product/design received may vary in shade slightly as this depends on the resolution of your computer screen. Picture is for illustration purpose only. Rebell 8 Digit Calculator. Dual battery/solar power. Pocket size ideal for desktop and handheld usage. Recycled plastic with rubber keys. OFFICE FORCE © HANDHELD CALCULATOR BATTERY POWERED HH8D. Dual-Powered solar and 1xLR54 Battery (included). Battery Powered: LR54. Battery: 1 x LR54 (included). WxDxH: 56x8x100mm. 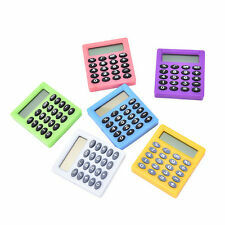 A compact sturdy and fully functional calculator available in four bright fun colours. Plastic body with raised tactile buttons and clear display makes for easy use. Standby power shut down and solar power conserves the battery power. NETWORK, CABLE & ADAPTER (1). Handy Pocket Size Calculator. COMPUTER & NETWORKING (6). The goods are your responsibility until they reach our warehouse. Handy size H 110mm x W 65mm (approx). If your order not processed. Small calculator, easy to carry round.